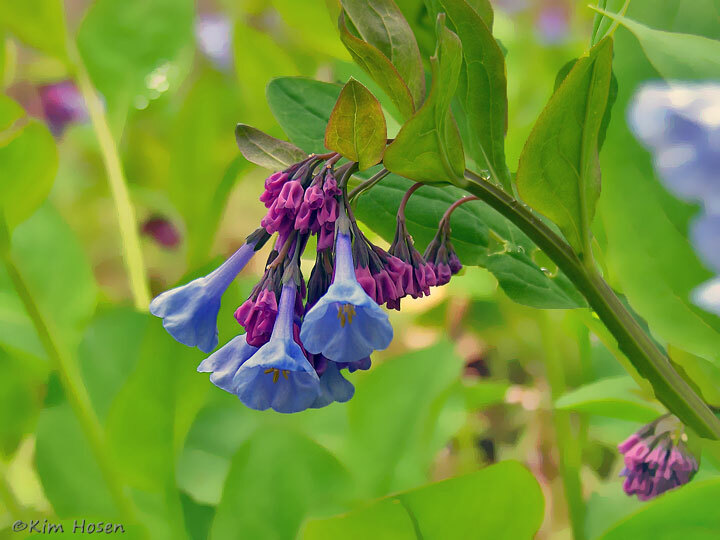 Virginia bluebells are one of the prettiest and most popular wildflowers in Northern Virginia. Beginning in mid-April, bluebells light up riverbanks and announce that spring is here. This pretty wildflower thrives in rich floodplain soils. At Merrimac Farm, one of the largest colonies of Virginia Bluebells in Northern Virginia carpet the floodplain along nearly one mile of Cedar Run, presenting a spectacular display of blue every year in mid-April. The showy, bell-shaped blooms turn from pink to blue as they mature, then back to pink after pollination. Some blossoms may remain pink and occasionally a white blossom even can be seen. Pollinated by bees, bluebells reproduce from seed or spread from rhizomes, roots that serve an underground reproductive structures. Virginia Bluebells grace our riverbanks for only a few short weeks each year. They bloom in early spring while the tree canopy is open and more light reaches the forest floor. Shortly after blooming the foliage begins to die and Virginia Bluebells disappear completely by early summer when the tree canopy closes. Click here to view photos from the April 9-13 2008 Virginia Bluebell Tours at Merrimac Farm.